Blooming in Japan: Creative Purist? I bet you didn't have me pegged for a car enthusiast! Actually I am not but I really enjoy documentaries about any kind of creative and/or business pursuit. Over the weekend I watched one called Retro Car Kings on The Discovery Channel. 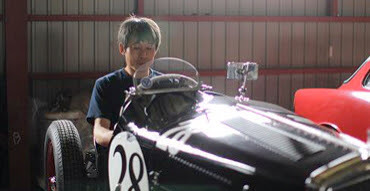 In this particular episode they were in Japan visiting vintage car restoration shops. As pointed out in the program there are several schools of thought as to the approach. One guy was a specialist in creating mash-up cars, like a Rolls Royce engine and a Ferrari body. Another guy was king of modification, he cut off the rear fenders in order to house ginormous fat tyres that would ultimately win on the race track. Another guy spared no expense customizing cars with modern features. Perhaps the same guy, I am not sure, was a paint expert, spending hours creating a customized paint colour. It was quite fascinating. The man pictured is what you might call a purist. At Officina Ishikawa he restores cars back to their original condition. He does not deviate. His approach was to treat the cars like museum pieces, he actually wore latex gloves when reassembling some components of the engine. The workshop was pristine. He did calisthenics each morning before starting work. His cars are worth millions of dollars once they are complete. They were quite simply beautiful. I started to think about what approach I would take. I liked the "stick to the original idea" approach best. I thought about my bags, for Mee a Bee. I use only Japanese made materials, threads and notions. I am very strict about this even though it might be possible to buy cheaper components. I won't. Am I a purist? What kind of car restoration artist do you think you would be?